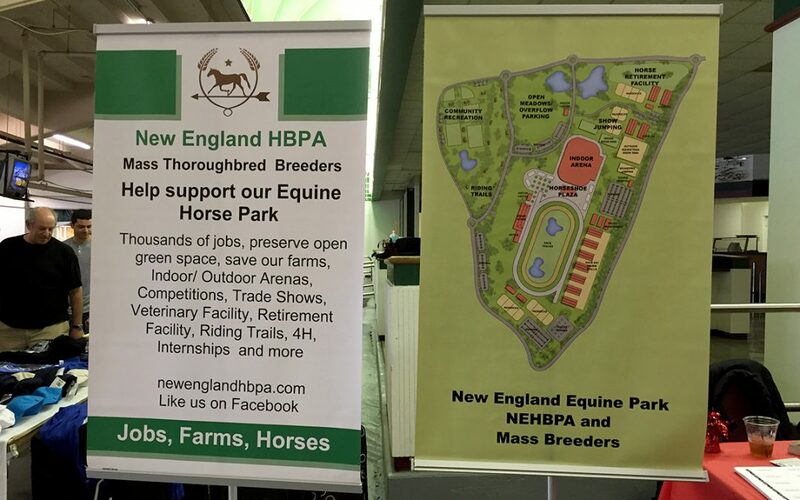 On behalf of the NEHBPA and the Massachusetts Horse Park Project, we wanted to give our members and supporters some recent updates. Although I know a lot of us have been waiting patiently, however at the same time we have undertaken a diverse, large scale project that will be a permanent solution and it just doesn’t happen overnight. The good news is, we’re closing in on putting the final package together! We are currently finishing a Master Plan by one of the best Equine Engineers in the country. The Plan will show what the layout of horse park will look like, the time frames for completion and the costs associated with it, along with completing a Pro Forma. Remember, once the race course is built, temporary barns and stabling can be erected to facilitate racing while development of the Park is ongoing. Racing could begin in a year in this scenario. Finally, our official Bill #185 will be submitted as a complete package, with all the above, to legislation for approval to move forward with the development of the Horse Park, the 1000’s of jobs and the $100 million-dollar economic impact benefits it will have on the Commonwealth. “I support the New England HBPA and their efforts to create a Massachusetts Horse Park, year-round racing, the thousand plus jobs that will be saved and created, in addition to the estimated 100 plus millions of dollars which the entire Commonwealth and equine related agricultural industry will benefit from as a result of the Horse Park.